Last week I got my second Bulu Box. Bulu Box is the first health, nutrition and weight loss discovery box designed to help you feel your best. 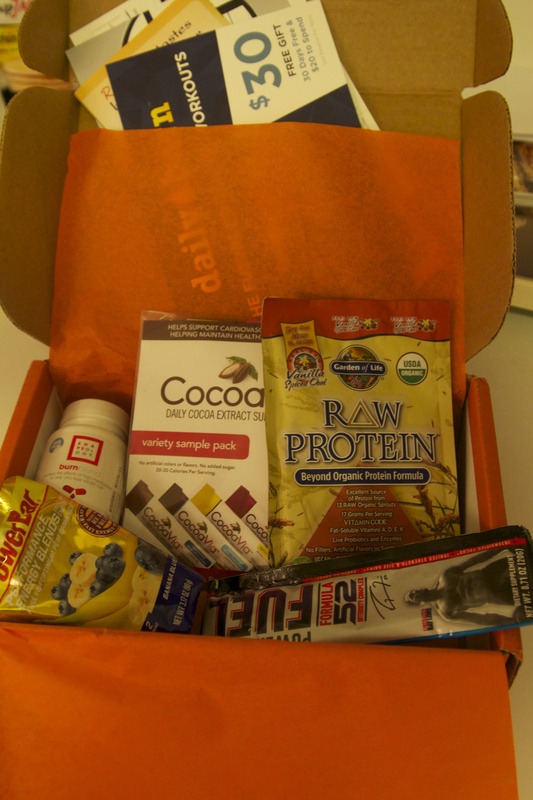 Each month, you’ll get a custom box filled with a new mix of 4 to 5 premium samples from top brands to try. Every sample is sufficient enough to decide if the product is right for you. Of course, shipping is always free and you can cancel anytime. Share your thoughts about each product in our sample surveys and you can earn 50+ Rewards Points (that’s $5!) each month! Use your points to purchase your new favorites in full size at BuluBox.com. This mix supports cardio-vascular health with the natural taste of rich chocolate packed with cocoa flavarons. You suppose to mix it into your milk, oatmeal, yogurt or protein shake. I saw it at the store before, but didn’t want to buy the whole package, so I was happy to try it from the Bulu Box. It tastes pretty good, and I might have it sometimes in my protein shake. I got it this month again. I already said what I think about supplements like this. 3. PowerBar Performance Energy Blend. Fuel your body before, during and after exercise with natural ingredients like bananas and blueberries. Energy Blends make the perfect on-the-go boost for the endurance athlete in you. Sounds good, and tastes good, but it’s easier for me just eat the real fruits. If I don’t have anyhing to snack on, and can’t get any fresh fruit, I would probably go with it. But you can also buy just baby puree food and have it as a snack. 4. Twin Lab Power Fuel. Power Fuel intensifies your muscle pump to boost performance and ignite strenght gains. It utilizes four types of carbohydrates, absorbed sequentially, to put your muscles into overdrive and keep them there rather than spiking and crashing. It’s a good supplement for heavy-weight lifters. I can use it from time to time, but in general, I feel totally ok during exercising without it. 5. Garden of Life RAW Organic Protein Powder. Packed with protein, vitamins and live probiotics, Garden of Life Raw Protein is a great meal replacement or post workout drink. Raw Protein is vegan, gluten, dairy, soy free and still tastes delicious. I love Garden of Life. I had their protein powder(chocolate) before, and it tastes good. This time I got Vanilla Spiced Chai and it tastes delicious. This sample was good. 6. Online Training. Daily Burn. Get your sweat on and burn fat anywhere with access to an enormous library of workouts spanning all areas of fitness at DailyBurn.com. I got the gift card to use on this site, to upload different workouts and exercises and use them for 1 months for free, and 20$ store credit to spend on nutritional supplements . In general I like my first box more than the second one, but I still found some nice samples in August box to use. I will definetely share my experience with the next month BULUBOX. But for now if any of you want to try the BULU BOX there are a few promo codes that you can use to save money. 2. You want to try BULU BOX for FREE? Use this code BULUGAN227 and you will get 10$ off from you first box . That means you get your first box for free, and don’t need to pay for shipping. Potatoes are very popular in Ukraine. I remember from my childhood, we ate potatoes almost every day. My favorite dish was mashed potatoes with piece of chicken. I could eat mashed potatoes for breakfast, lunch and dinner. To tell you the truth, I still love it, but don’t cook it very often. Because it is not recommended to mix the starchy vegetables with the animal protein, I kept looking for some recipe that will work and taste as good as my favorite dish from the past. 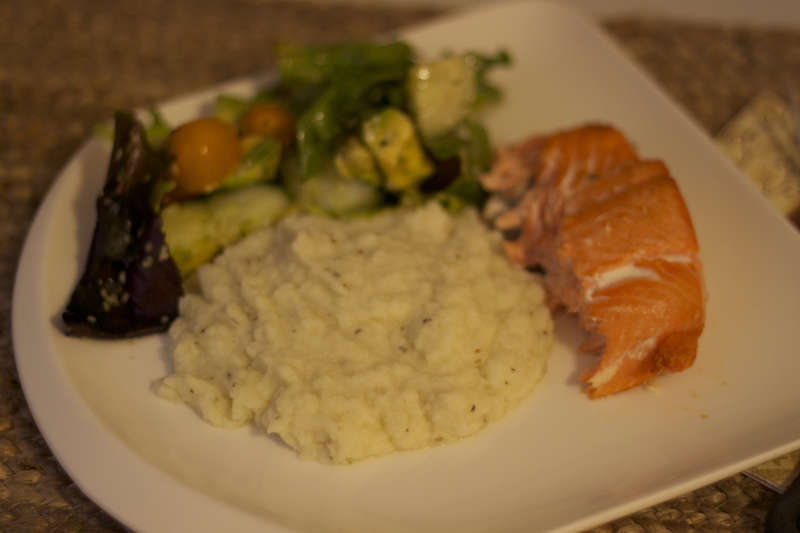 When I found Cauliflower ” mashed potatoes” idea, I wasn’t sure if it tastes good. It might taste good as a cauliflower, but not as good as mashed potatoes. Anyway, I got the huge head of cauliflower and tried to cook it at home. This cauliflower-based version is the same texture to enjoy as mashed potato, but sans the butter, whole milk and table salt that make mashed potatoes a beauty-busting food. 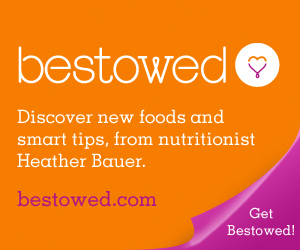 Bring water to a boil and steam cauliflower in a steamer for about 6-7 minutes, until softens. Put the cauliflower florets in a food processor with the blade in place. Add garlic, almond milk, olive oil, black pepper, sea salt and rosemary. Pulse long enough to achieve the desired consistency. I served it with baked salmon and fresh veggies salad.